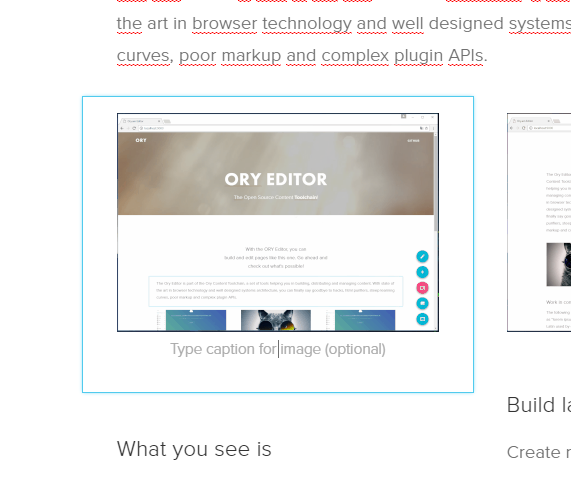 The core is the main system of the ORY Editor. It contains the logic for creating and modifying layouts and is responsible for handling plugins. the Redux store is created as well. Because of this, it is important to only instantiate the Editor once in your application lifetime (this is called the singleton pattern). const editor2 = new Editor() // Don&apos;t do this. Now we know how to create an empty editor. Let&apos;s add some plugins as well. We will use plugins available from the ORY Editor repository. We call those plugins "ory plugins" because they are written and maintained by us. Let&apos;s take an image plugin for starter. The image plugin is a simple content plugin that allows you to add an image by pointing the plugin to an image URL. It does not support uploading images at the moment. We assume that you are running webpack with a plugin capable of importing CSS. If this confuses you, go to https://gitter.im/webpack/webpack and ask for help - they are very nice. Next we create the editor instance and pass the image content plugin via the constructor. It is also possible to add/set/remove both layout and content plugins during runtime (meaning after creating the editor instance) as followed. Using these methods will force an editor re-render. All we did was render the Editable component using ReactJS and passing the editor instance. There&apos;s however a problem here - nothing will happen. This is because there is no content available to render. Let&apos;s change that! To create an empty state, the core exports a method called createEmptyState. The result is a JSON object containing, amongst others, a unique id. console.log(editable.id) // gives something like "29fb21c6-6e00-416f-a8e1-2be9fb84801c"
Now that you know how to render an editor and fill it with an empty state, let&apos;s take a look at how saving and loading looks like. You can catch changes using the onChange property of <Editable>. onChange accepts a function with a single argument - the editable&apos;s state. The state you receive is a serialized version of the internal editor state. It contains primitive values (string, number, array, map) only and is safe to serialize to JSON. or use the `trigger` API. editor.editable.update(editable) // update adds an editable if it does not exist yet, or updates it when it exists in the store.